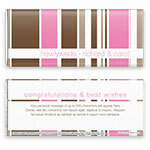 A fun twist on a classic design brings charming style to this wrapper - suitable for any celebration. Design: Vertical stripes in different sizes. Personalization: Front message and names, back title and message.